Valentine's day is coming up and people are busy searching for a place to celebrate. 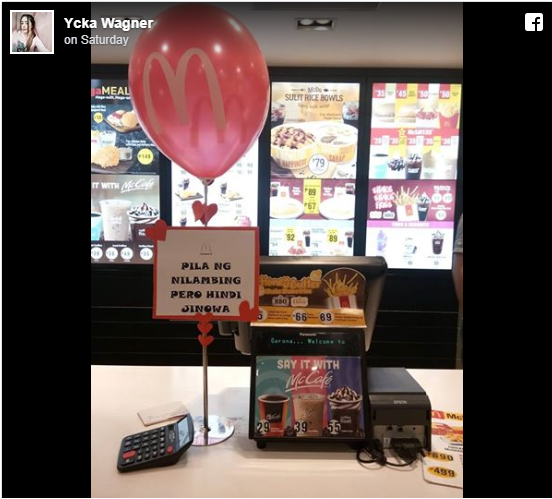 McDonald's branches nationwide are setting up queues depending on customers current status, using labels as "Pila Gg Single," "Pila Ng Marurupok,""Pila ng nagmahal, nasaktan, nag McDo" and "Pila ng nilambing pero hindi jinowa." Different branches nationwide have their own way of 'gimmick' which now-viral were other customers would be glad to the message on the counter. However, the idea won't be as excited to people who wanted a shortest line, like usual, to get the fastest lane for a short breaks. In the Facebook post of Juan Calbayog, "Akala ko priority lane talaga ang "PILA NG INIWAN." Pero bes, wala talagang pumipila sa "PILA NG MAY FOREVER." Tingnan mo nagkumpolan sila sa linya ng "iniwan."